An essential part of fish keeping is making sure you have all the right equipment to provide the optimum conditions for the residents of your tank. For most fish, correct water temperature is critical. Water that’s either too hot or too cold could kill them. Therefore you need a thermometer so you can keep an accurate eye on the temperature. You’ll find a wide range of makes and models on the market, and not all are created equal. To help you out, we’ve come up with a buying guide to aquarium thermometers, as well as a roundup and mini-reviews of the best ones out there so you can more easily find the best one for your needs. What is an Aquarium Thermometer and What Does it Do? A thermometer is a device that measures temperature. So, it follows that an aquarium thermometer is a device that measures the temperature of the water in a fish tank. It’s vital that your tank’s water remains within a specific temperature range, which depends on the needs of whichever kind of fish or other aquatic creatures you keep. Sure, you might have a heater set to a specific temp, but no heater is 100 percent reliable. As such, you need to have an aquarium thermometer to monitor the water temp and make sure everything’s running smoothly. Some more high-tech models even have an alarm that sounds when the temperature rises too high or falls too low. What are the benefits of having a thermometer in your fish tank? Let’s examine this further. Most importantly, it allows you to monitor the temp of the water closely, to ensure it stays in the correct range for your fish. Heaters aren’t always reliable and can break down or be out by a couple of degrees, but a thermometer will alert you to any malfunctions. It takes away the need to guess whether or not your tank’s water is at the correct temperature. The correct water temperature helps keep fish alive and free from disease. Each type has its pros and cons, which you should consider carefully before buying. Stick on types are thin LCD strips that stick on the outside wall of the tank. They are an easy to read thermometer that display the temperature on a liquid crystal display. On the plus side, they are inexpensive, easy to set up, and basically impossible to break. 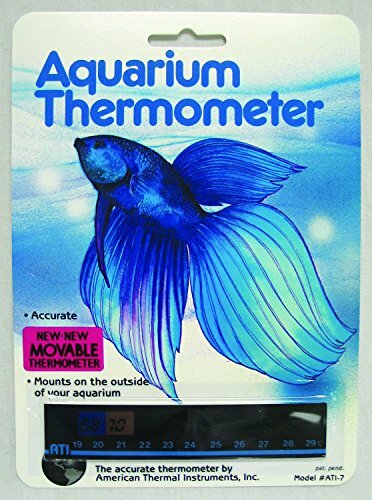 Aside from that, they don’t have much going for them, compared to other types of aquarium thermometers. Since they stick on the outside of you tank they don’t give the most accurate readings. The external temperature can affect the reading you get, so you must be careful not to position them in direct sunlight or next to a heater or air conditioner. It can be difficult to read temps on LCD aquarium thermometers, especially in bright light or if you’re not looking at them head-on. They also don’t feature an alarm if the temperature goes out of the required range, so you need to check them regularly. 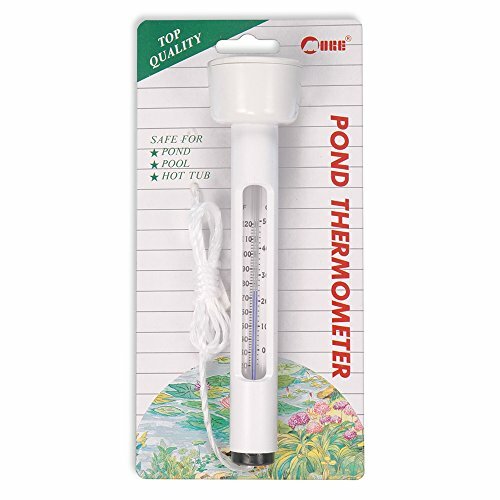 Standing or floating fish tank thermometers are analog models that must be fully submerged in the water and show the temperature on a dial. You can find a range of variations on standing or floating thermometers—some are weighted down, some use suction cups or a magnet to stick to the side of the tank, and some merely free float near the surface. Because they go completely under the water, they’re very accurate. The ambient temperature outside the aquarium won’t affect the reading. They also don’t require batteries, so there’s no chance they’ll run out of juice. Floating and standing types do have some negative points, however. Some are made of glass, which would cause issues if it broke inside the tank. They can also be hard to read, if they have small temperature dials or markings, and they don’t have an alarm. Digital aquarium thermometers consist of a digital display unit kept on the outside of the tank and a temperature probe that’s submerged inside the tank. There’s usually a wire that connects the digital display to the probe, but you can find some wireless models. Like floating or standing types, quality digital models give a highly accurate reading, since the probe is submerged in the water. Many digital models also feature an alarm that will sound if the water temperature goes above or below a specified range, so you can take steps to rectify the issue ASAP. 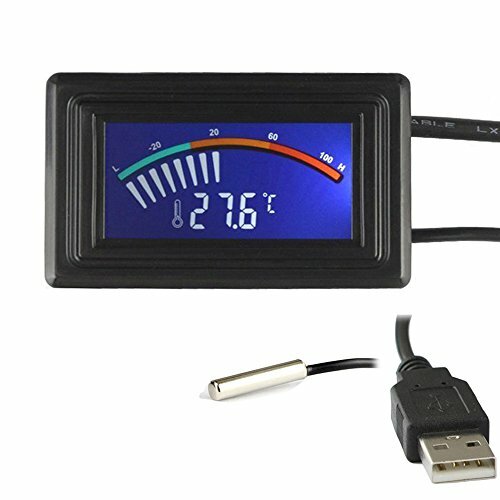 The display unit is easy to read and generally allows you to read the temperature in either Centigrade or Fahrenheit. The only real downside to digital aquarium thermometers is that they’re the most expensive variety. You must also be careful that the battery doesn’t die down or the power doesn’t go out. Though it’s certainly not the most expensive item you’ll buy for your fish keeping hobby, you still want to try to get the right one, first time, so you don’t have the expense of replacing or returning it. Here are some of the main factors to consider when selecting the best model for your aquarium. How easy is it to use and install? It’s a thermometer—you should be able just to set it up and go. If it’s complicated to use or install, look for a different model. Accuracy. If inaccurate, the temperature in your aquarium might be wrong, and your fish could be in distress. It should be accurate to at least +/- 1 degree Fahrenheit. Range. Ideally, your chosen model should give accurate temperature readings in a range from 50 to 104 degrees Fahrenheit. Durability. A good fish tank thermometer should be durable, long-lasting, and remain accurate over time. Look for models made from durable materials, especially if they’ll be submerged inside the tank. Temperature readability. Look for a model with a large, clear display that’s easy to read. We’ve combed through the many online stores, review sites, forums and more to find the thermometers most recommend, most highly rated and that should make the shortlist of any buyer. Below you will find our top 7 recommendations, a mix of the three types and at different price points, so there will be the right thermometer for pretty much all and any aquarium. Although the ‘Keynice Digital’ isn’t designed exclusively for aquarium use its good degree of accuracy, as well as the rustproof stainless steel probe makes it suitable for this purpose. This is an affordable digital thermometer, that’s reliable and durable enough to trust with the wellbeing of your fish. The Keynice is a digital model that comes with a probe, which must be submerged in your fish tanks water. Since it’s not explicitly designed for aquarium use, it doesn’t come with a suction cup or similar to mount it to the outside of the tank, which can be inconvenient. It is powered by USB. Since it will be in constant use, it’s not practical to power it using the USB port on your computer. Instead, you’ll need a USB adaptor for your power outlet, or a modern power outlet that features an integrated USB port. The Keynice is comprised of the main body, on which there’s a screen that shows the temperate, and the probe, which takes the temperature and is attached by a wire to the main body. The probe goes in your aquarium, and the main body stays outside the tank so that you can read the results. It can measure a range from -58 to +230 degrees Fahrenheit (that’s -50 to +110 degrees Celsius). The accuracy is +/-1 degrees Fahrenheit. The large digital display is extremely easy to read. The probe sits inside the tank, under the water, whereas the main body remains external to the tank. This is an extremely well-made thermometer, which appears to be both accurate and reliable. It’s not the easiest to install, however, as it doesn’t have any means to mount it to your aquarium included, so you’ll need to figure out how to mount it yourself. You can change between Centigrade and Fahrenheit, although the switch that changes the display between the two is on the back of the unit, so it’s tricky to access once the unit is mounted. Seems to be durable and long-lasting. This is an excellent digital thermometer that’s a steal for the quality. It might not feature many extra features, but it’s durable and reliable. We’re not 100% sure, but it seems to be that all three of these models from different brands are made by the same manufacturer, and then sold by different companies under their own branding. Apart from the branding, the Zacro, RISEPRO, and HDE are all exactly the same, in looks and functionality, so buy whichever one has the best deal on at the time of buying. Although basic, these aquarium thermometers offer decent value for money for fish keepers on a budget. 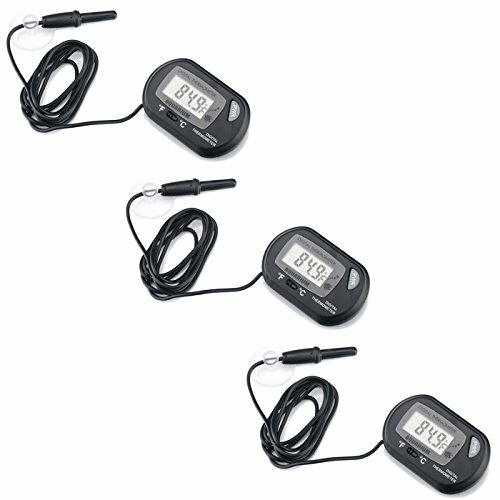 These are digital thermometers with probes. Each comes with a suction cup to attach to the outside of the tank. All three models, The Zacro, RISEPRO, and HDE all run on a single button cell battery. You’ll get one included in the pack, and you may get a spare, depending on which option you choose. They feature a probe that you submerge in your tank, which is attached to the main body of the unit with a wire. You can stick the main body of the machine to the outside of the tank, using the suction cup. The probe monitors the temperature, them feeds the results back to the body of the thermometer, where the results are displayed on the LCD screen. Not only do these thermometers have a wide range of between -58 and 158 degrees Fahrenheit (-50.0 to 70.0 degrees Centigrade), they’re also accurate to +/- 1-degree Fahrenheit. Thanks to the large LCD display, it’s effortless to read the temperature. While you place the main body on the outside of the tank, the probe goes under the water, giving an accurate reading. These thermometers are decent enough, considering how inexpensive they are, but don’t expect them to be quite as durable or reliable as some other models. Installation is straightforward: Stick itr on the outside of the tank, the probe in the water, turn it on, and you’re ready to go. If you’re looking for a cheap and cheerful digital aquarium thermometer, look no further. All three models are available on Amazon. Simple and affordable, yet effective, it’s hard to go wrong with the Marina Deluxe Floating Thermometer. Since it’s made of glass, it is technically breakable, but it’s very unlikely to shatter in the tank, even if you have fish that like to get into everything. This is a floating type that comes with a suction cup to stick it to the aquarium wall. The Marina Deluxe doesn’t require a power source. If you’re looking for a simple thermometer, this floating model fits the bill. Simply put it in your tank, stuck to the inside of the glass using the enclosed suction cup, and it’s ready to use. It works like a traditional mercury thermometer (though the liquid inside isn’t mercury)—as the temperature rises or falls, so does the liquid inside, allowing you to take a reading. The Marina Deluxe has a temperature range of between 30 and 120 degrees Fahrenheit, which is more than adequate. While it’s fairly easy to read, those with poor eyesight might struggle to read the markings. It does, however, feature a safety zone indicator, which makes it easier to tell if the temperature is in the correct range. You must place the Marina Deluxe inside the tank, held in place by the suction cup. Since it remains fully submerged, it tends to get very accurate readings. 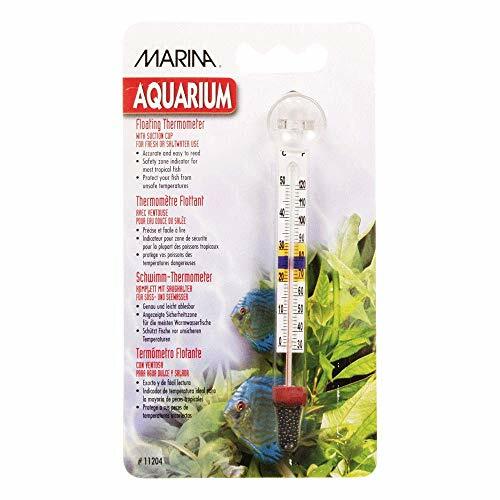 It could hardly be easier to install this thermometer; Stick it on the inside of your aquarium, and it’s ready to go. Since it’s made from glass, it’s not the most durable option available, but the fact it floats means it won’t drop to the bottom of the tank where it could smash, even if the suction cup comes unstuck. If you’re in the market for a floating thermometer, this one comes highly recommended. The ‘American Thermal’ is a basic, inexpensive LCD model. It isn’t the most high-tech or accurate option out there but will suffice for hardy fish who can deal with some temperature fluctuations, or as a backup to give you a rough idea of the water temp. This is a stick on variety, which means it has an adhesive back, which adheres directly to the outside of the tank. This particular stick on model is designed to be movable, so you can peel it off your tank and stick it back down. As a stick on type, the ‘American Thermal’ doesn’t require a power source. All you need to do is stick it on the outside of your aquarium, and it will give you a temperature reading. It is sensitive to changes in temperature, and the thin LCD display lights up the appropriate reading on the strip. It has a temperature range of 64 to 84 degrees Fahrenheit. The manufacturer doesn’t list the degrees of accuracy, but regular users have had mixed results. Some say it’s accurate within 2 degrees Fahrenheit either way, whereas others have found it displaying temperature readings up to 5 degrees higher or lower than true, which could be an issue. It’s not the easiest thermometer to read in bright light or from an awkward angle, rather than head-on. This thermometer remains completely external to the tank, meaning it’s influenced by the ambient room temperature and doesn’t get 100 percent accurate readings of the water temperature inside the tank. The ‘American Thermal’ is extremely easy to use and install—just stick it on and go. Plus, the design makes it extremely difficult to break. However, this (and other stick-on types) wouldn’t be our first choice, as it lacks the accuracy of other options. As far as stick on thermometers go, the American Thermal is an excellent choice. We like that it’s movable, so you can switch it between tanks or change the positioning, if necessary. The Fluval EDGE Digital Aquarium Thermometer is a simple stick on model that comes from a trusted brand in the world of fish keeping. It might not be as flashy or accurate as some other options, but it’s straightforward to use and is excellent for tanks where being a degree or two out won’t make a difference to the wellbeing of its residents. Though it’s described as a digital thermometer, this is, in fact, a stick on model. It sticks to the outside of the tank, so you can easily position it somewhere that’s easy to see, but won’t obscure the view into your aquarium. As a stick on model, the Fluval EDGE doesn’t require any sort of power source. The Fluval EDGE sticks to the outside of the aquarium. The gel material of the adhesive reacts to changes in temperature and lights up the relevant temperature markers. The Fluval EDGE can read temps between 64 and 86 degrees Fahrenheit, which is significantly less than many other models. The accuracy is only around +/- 2 degrees Fahrenheit, which also isn’t ideal. Since the Fluval EDGE is installed on the outside of the tank, it’s not the most accurate, as it’s trying to measure from the outside of the fish tank glass, and hence can be affected by the ambient room temperature. While very easy to install, the Fluval Edge wouldn’t be our first choice. It’s great for getting a rough idea of the temperature, but you should have a backup thermometer for taking a more precise reading if it’s on the high or low end of the acceptable range. Because it’s essentially just a sticker strip, it’s highly durable and won’t crack or shatter. Can be hard to read in the wrong lighting or from the wrong angle. 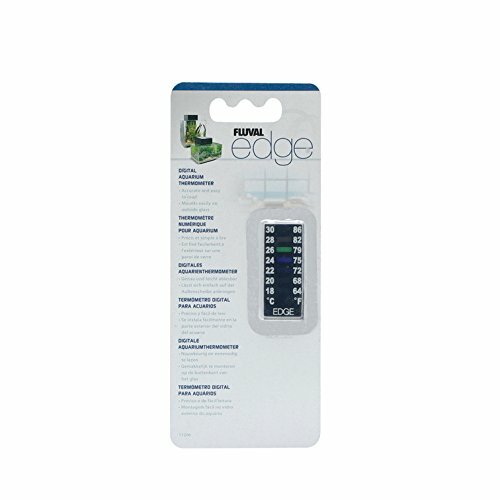 Anyone looking for a quality stick-on aquarium thermometer would be remiss if they didn’t consider the Fluval EDGE. The TAAM Rio Aquarium and Pond Floating Thermometer is a simple floating type that’s accurate, reliable, and durable. It costs a little more than some similar models, but it’s hardly going to break the bank. As a floating type, it goes inside the tank where it floats near the surface. It comes with a rope you can use to tether it if you wish, but it won’t do any harm if you do leave it free-floating. The TAAM Rio is entirely analog—it doesn’t require batteries or mains power. Simply plop the TAAM Rio into your aquarium, and it will start working right away. It floats vertically, so it remains the right way up for easy reading. While it does come with a tether, this is really for use in ponds—most fish keepers leave it free-floating in an average aquarium. The TAAM Rio has a temperature range from 20 to 120 degrees Fahrenheit and is accurate to within -/+ 1 degree Fahrenheit and features very easy-to-read markings. This thermometer goes inside the tank, submerged underwater, which gives it more accurate readings than those located outside. We love how easy the TAAM Rio Aquarium and Pond Floating Thermometer is to install—you just have to place it in the water. It’s also very durable, as it’s made from made from high-impact plastic, rather than glass. This durable thermometer is extremely easy to use and won’t let you down. The LCR Hallcrest A-1005 Liquid Crystal Vertical Aquarium Thermometer is one of our favorite stick on types available. It’s easier to read than other models and seems to be reliable and reasonably accurate, although it won’t stand up to digital models. This is a stick on type, which means it simply sticks to the outside of the tank. The LCR Hallcrest doesn’t require any source of power. One of the simplest types of thermometer, this model sticks to the outside of the glass, where it takes the temperature of the water from the other side of the glass. The temperature range is from 65 to 85 degrees Fahrenheit. While it only features a scale to be read in two-degree increments, it offers a color-based system for working out the precise temperature. Whatever’s lit up in the green box is the current temperature range. If the brown box above is lit, the water is 1 degree higher than the number in the green box. If the blue box below is lit, the water is 1 degree lower than the number in the green box. The LCR Hallcrest A-1005 is installed external to the aquarium, on the outside of the glass. Not only is it extremely easy to install—just stick it on the outside of the tank—it’s super durable, too. While it’s fairly easy to read, once you get the hang of it, the system of displaying temperatures isn’t as intuitive as with digital or floating/standing models. It might not have all the bells and whistles, but this thermometer is easy to use and serves its purpose well. If you are applying a stick-on thermometer on the outside of the tank, make sure it’s positioned below the waterline and away from vents, heaters, and direct sunlight. For thermometers that float, attach via suction cup to the inside of the tank, or use a probe connected to an external unit, again, keep away from direct sunlight and as far away from your water heater as possible. If the liquid in your thermometer is any color other than silver, it is not mercury. Typically, it will be some form of alcohol with colored dye. Silver liquid in a thermometer might be mercury, particularly if it is an older model, but new mercury thermometers are very uncommon. No matter what kind of thermometer you have, if it breaks underwater, it is a good idea to move the fish to another tank, if possible, and perform a major water change and vacuum the debris as soon as possible. Some sticker thermometers have a red line that simulates a liquid-filled thermometer display that we’re all familiar with. These are easy to read; the number beside the top of the line is your temperature. However, most display several colors across a range of temperatures, and these can be confusing. The blue/violet section is at the lower end of the temperature reading, and the red/orange is at the top. No matter the colors, the actual temperature will be somewhere in the middle. This zone often shows as green. So there you have it, 7 of the best aquarium thermometers on the market in 2019. Are there any exceptional models we’ve missed that perhaps should be included? Do you have any personal experience with any of the models we’ve detailed above? If so, we’d love to hear your thoughts, so please do drop a comment below!